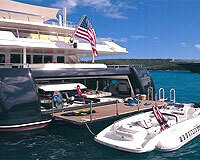 Match your yacht building needs to the right Asian builder/partner. Assist you in Asian shipyard acquisition and development. Convert Western interior design and outfitting projects so they can be understood and produced, cost effectively in Asia. Work closely with Classification Societies, e.g. ABS, LLOYDS, DNV, RINA, CCS, BV,etc. Virtual Office as well as On Site Consultation and Representation regardless of location. Arrange Asian CNC tooling for any sized FRP vessel or interior joinery project. Introduction to reputable Asian marine suppliers and manufacturers. Arrange and manage high end Yacht interior design, manufacture and delivery. Assist in relocating or starting any new Yacht related business here in Asia. Arrange invitation and introduction to members of the Asian Yachting Community, Municipal, Provincial and Federal Governments. Supplying your marine related company with a hungry Asian Market. Knowledgeable representation at Asian Boat Shows, Exhibitions, and Trade Fairs. Establishing and filling your Human Resource needs at home or here in Asia. Finding the right Asian design team willing and capable of Yacht quality rendering, styling, CNC conversion, electrical, mechanical, furniture / cabinetry and joinery design. High quality Yacht Interiors shipped to your location. Custom Stainless Steel yacht hardware built to your specification. Accurate shipping estimates and arrangements.